The second annual event began just as Hurricane Isabel was passing through the state. Steve Summer and George Parker played on—undaunted, if occasionally inconvenienced, by wind gusts in excess of 40 mph. Favorable weather followed for the remainder of the tournament. Local player Becky Essick dominated First Flight with a perfect 6-0 record. Tommy Harrington, a brand-new player from Greenville, NC, demonstrated a solid understanding of strategy. 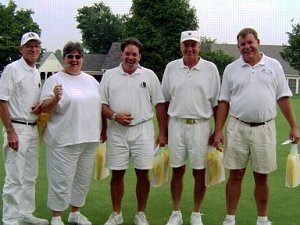 Local croquet maven and tournament organizer Danny Huneycutt was undefeated in winning Championship Flight. The Championship final was an exciting affair, with Parker racing the clock in a nearly successful bid to overcome a huge deficit.